A periodic newsletter from your friends at the Florida Native Plants Nursery & Landscaping in Sarasota, Florida. 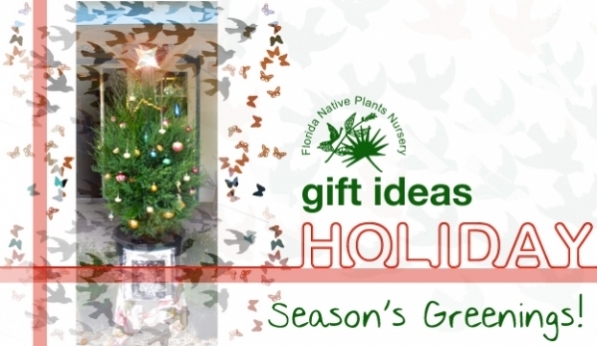 Usually we bring you an article on natural gardening, but this is a once-a-year special holiday mini-issue highlighting green gift ideas available at our nursery. We will send you our next issue, "Winter!" (about cold-hardy plants), in January. Thank you for your support this year and Happy Holidays from Florida Native Plants Nursery & Landscaping. Tis the cooler season to plant cold-hardy trees and shrubs. Plant a native yard, not only as a gift to yourself this season, but as a gift to the birds, bees and butterflies. Give something back, create a little habitat. It's the greenest holiday tree Floridians can have this season - a locally grown, living, native, RED CEDAR. To top it off, we are dressing them up in handmade recycled paper butterfly garland and origami stars for you. Keep this little tree close to your heart for the holidays or give someone else the gift that keeps on living. After the holidays plant it in your yard, donate it to your favorite local organization, give it to someone special (with the yard space) or return it to us. Red cedars, with their dense, evergreen foliage, are a favorite food, nesting and shelter tree for our native resident and migratory songbirds. Call the nursery before December 23rd, to order your table top decorated tree with free home delivery, $50. Or just the tree, $18. Give the gift of Real Florida green. Good towards plants, delivery, design, installation, maintenance and our nursery goods. Not local but want to buy for a local? 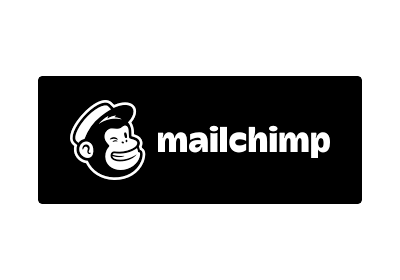 We can take your order over the phone and send a gift certificate out to anyone for you. 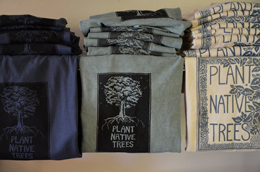 Organic cotton t-shirts with a message: Wear our environmentally-friendly tees created by a local artist printmaker. $22. 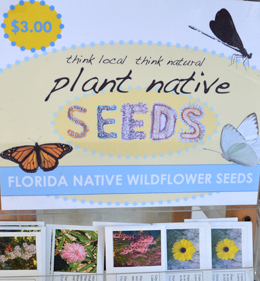 We've got the hardiest wildflower seeds for our area from the Florida Wildflowers Growers Cooperative. $3.00 per packet. 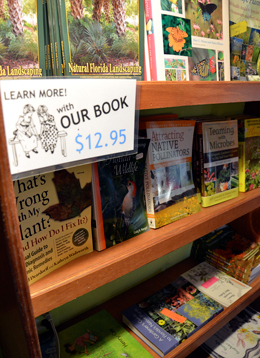 We've read them all and these are the ones we recommend: We carry the best of the best when it comes to gardening books for Florida. Learn more about natural gardening with natives, sustainable gardening, edible gardening and wildlife. We also have some nature-inspired children's book! $6. to $35. Images of Florida flora and fauna by photographer Fran Palmeri (www.franpalmeri.com) set in blank photo cards all ready for a special message from you to a loved one. We have a random selection of her amazing photo cards. Send someone a unique image that reflects true Florida. Want to grow from seed? 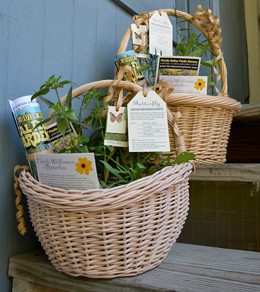 We now carry organic, southern heirloom, veggie and herb seeds. Add organic edibles to your garden that can withstand our Florida seasons. $2.50 per packet. Are you a current Florida Master Gardener, Master Naturalist, member of the Florida Native Plant Society, Audubon, Sierra Club, or other environmental group? We want to honor your commitment and offer 10% off your total every time you buy plants from us. Please present your current membership ID at time of purchase. 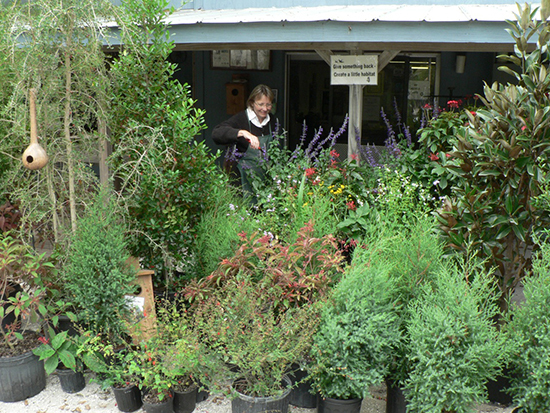 Copyright © 2011 Florida Native Plants Nursery & Landscaping, All rights reserved.